Reebok Runner Reviewed - To Buy or Not in Apr 2019? The original Reebok Runner is an all-around high-quality cross training and road running shoe. Reebok incorporates their signature style and quality in this neutral running companion. The shoe comes in a variety of colors with a more subdued color pallet and the signature Reebok insignia along the side. The hallmark of this shoe is its ability to protect the runner against the harmful shock of each footfall while protecting the shoe against wear and tear. This can be attributed to high abrasion rubber that is strategically placed along the outsole. Additionally, this shoe is designed to keep athletes comfortable through a breathable upper, compression molded midsole, and high tech sock liner. This is the first iteration of the Reebok Runner, so runners who are looking for a quality intro level running shoe at a deep discount will love the price tag on this shoe. 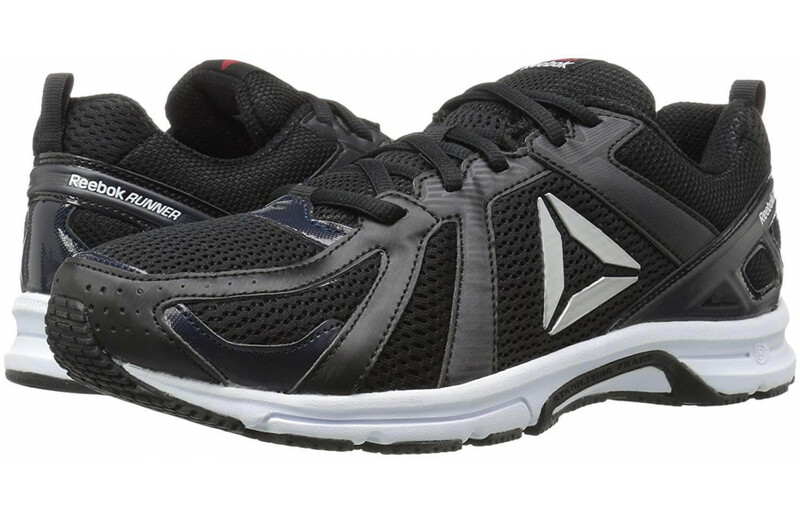 The lightweight nature makes it a good choice for a variety of activities and the added traction makes it a great gym companion for the treadmill, group fitness classes, or while lifting weights. The outsole of this shoe provides a protective, solid base for runners. 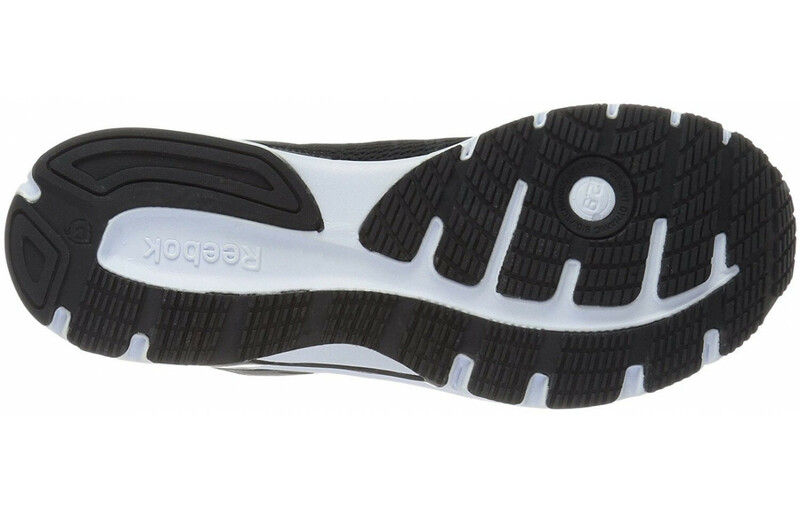 Reebok uses a high abrasion rubber throughout the outsole. To provide added protection and durability, they also layered this material in strategic, high tread areas. The tread design of the underfoot promotes a higher level of grip and traction, keeping runners secure and safe on various terrains. The outsole features a horizontal flex groove that runs from the heel to the toe of the shoe, creating a pliable fit. 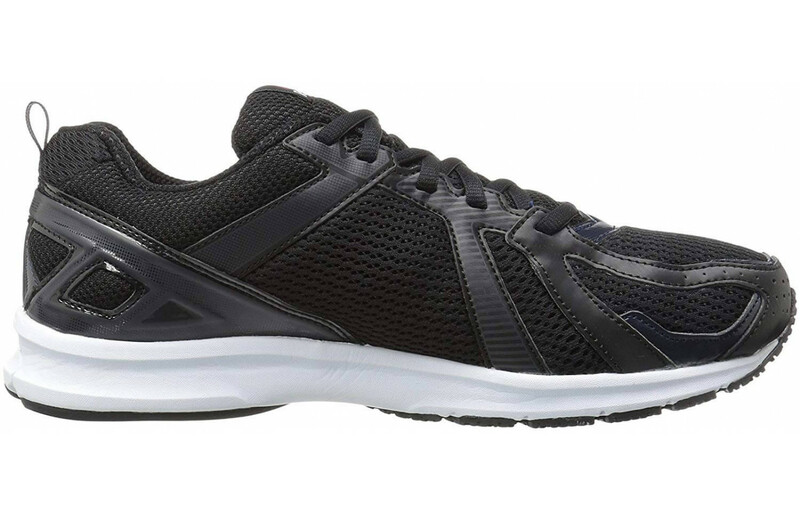 Additionally, Reebok added smaller flex grooves along the forefoot to support the natural movement of the runner. 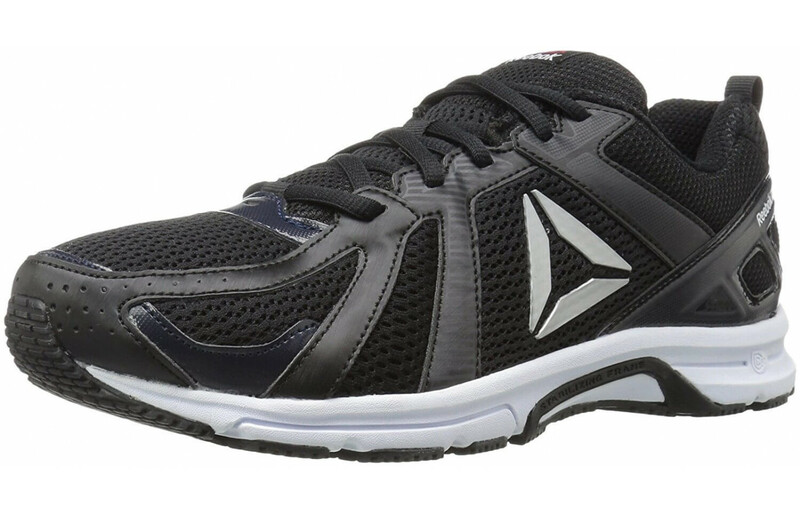 The midsole of the Reebok Runner is made from a CMEVA (compression molded ethylene vinyl acetate) foam unit. The difference between a CMEVA and an injected molded midsole foam is the density and higher level of springiness and bounce. This material works to absorb the shock of each footfall, protecting the runner from potential long-term injury. This unit is adaptable and molds to the unique shape of each runner’s foot. Additionally, Reebok incorporated a Memory Tech Sock Liner. This sock liner provides an added layer of cushioning. It conforms to the shape of the foot, providing arch support for all arch heights. Runners found the upper of this shoe to be both breathable and supportive. The upper material is a breathable mesh with an open design. Layered on top of this mesh is a collection of synthetic overlays. Even the overlays have visible ventilation holes that promote healthy air circulation into and around the foot chamber. The synthetic overlay system provides a structured and supportive fit. The overlays connect to the lacing system, allowing the runner to increase or decrease the snugness of the fit. The heel counter in the rear of the shoe helps keep the foot locked in place. All of these details work together to decrease the risk of blisters and hot spots. Reebok also included a durable pull tab in the heel to assist the runner with getting the shoe safely on and off. This shoe is certainly on the lighter side compared to the average running shoe on today’s market. The Runner weighs in at 9.3 ounces. The lack of cumbersome stability details and the lightweight upper provide this lighter feel. Although this shoe is lighter than many, it isn’t going to provide the extra minimalist feel that some runners are looking for. The high abrasion rubber outsole is strategically layered in sections of the outsole, keeping this shoe from out of the super lightweight category. Just by looking at this shoe, athletes know that it will provide a high level of ventilation to the foot chamber. The woven mesh material provides abundant ventilation and even the synthetic overlays that lay on top of the mesh have ventilation holes. The strategically placed ventilation holes allow air to enter and circulate around the foot chamber. This helps to regulate the temperature inside of the shoe and keeps runners comfortable even in the warmest weather. By continuously circulating air into the foot chamber, runners will avoid blisters and hot spots during their workouts. There are a few added details in this shoe that Reebok included to ensure that runners can get the most comfortable ride possible. Starting in the upper, the high level of breathability helps keep runners from overheating. The improved circulation also reduces the risk of blisters and hot spots, allowing runners to workout longer without discomfort. The midsole unit of this shoe is springy. Along with the midsole unit, the Memory Tech sock liner is designed to adapt to the shape of the foot, cradling the foot and providing arch support. This shoe is also offered in wide sizes to accommodate all foot shapes and sizes. The Reebok Runner is a sleek, slim looking shoe with a sporty aesthetic. This shoe is offered in multiple color options, but overall the color options are more muted, so runners who are looking for wild colors and unique patterns will have to consider other options. The synthetic overlays along the upper help to create an athletic look, keeping this shoe from being a good option for a fashionable, casual accessory. Runners were pleased with the high level of durability offered in this shoe. For starters, although the upper is designed using a woven mesh material, it is layered with synthetic overlays. These overlays not only provide support to the runner, but they also act as a barrier, protecting the runner from the elements as well as from wear and tear. These overalls help the shoe maintain its form but also maintain a newer look for a longer period of time. The outsole of this shoe is made with a high abrasion rubber. This rubber is layered in certain high tread areas to ensure that the shoe can hold up against extensive use. Since the midsole foam is Compression Molded, it is able to hold its shape better and last longer. One of the ways that the Runner protects athletes is through the reflective details that can be found along the upper. These details help make the runner visible in low light areas, keeping them safe regardless of where they are running. In addition to the reflective detail, the CMEVA midsole unit is shock absorbing, protecting the runner from joint pain and long-term injury. The heel counter along the back of the shoe keeps the foot in place and protects against friction that can lead to blisters. Finally, the high abrasion rubber outsole adds traction, working to keep the runner upright and safe regardless of the terrain. Although the outsole of this shoe is made using a high abrasion rubber that is both durable and protective, runners reported that the shoe is still able to maintain a high level of responsiveness. Runners reported feeling connected to the ground below them, making them able to respond quickly and efficiently to changes in pace and direction. The CMEVA midsole foam unit is thinner than other midsole foams and allows the runner to stay connected to the ground below. The original Reebok Runner offers support to runners in a few different places. The first is the reinforced synthetic overlays that are layered on top of the mesh upper material. These trace the outline of the shoe and connect to the lacing system to provide runners with more motion control and support. The other support detail that is added to this shoe is the heel counter along the heel of the shoe. This locks the heel into place, reducing unwanted movement and friction. This shoe is created for the road, but the high level of traction provided by the high abrasion rubber makes it a good choice for any cross training activity. The outsole design offers added traction that keeps runners secure and safe on uneven terrains. The improved pliability of these shoes also makes them a good choice for workout classes that require dynamic movement. This is an older shoe and there is also a newer model offered. Both of these details translate to a very affordable shoe for runners. This shoe is affordable enough for runners to purchase a few at one time, and still, they will be well below the average cost of a high-quality road running shoe on today’s market. The lower price tag is one of the features that make this a good entry level running shoe. The outsole of this shoe is made using a high abrasion rubber. This material is layered in strategic places along the underfoot in the highest tread areas to increase the traction and durability. The design of the outsole features added gripping details along the outer rim of the underfoot to help keep the foot stable and secure, even during dynamic movement. Runners reported that the higher level of traction on this shoe makes this a good option for working out on slippery terrain or terrains that require a little more security, like running bleachers. The outsole of this shoe provides runners with a flexible landing platform that supports the runner's natural movement. This can be attributed to the strategically placed flex groove along the underfoot. While some shoes will add a long flex groove that runs the length of the outsole, this model does that and it also includes flex grooves in the forefoot area. By including forefoot flex grooves, Reebok increases the overall flexibility of the shoe, making it highly pliable. This is a neutral running shoe. It lacks the added stability features that would qualify it as a high-quality stability shoe. Since this shoe is designed for runners with a neutral gait, runners who are looking for a corrective shoe to help with issues of over or under pronation will have to consider another option. This shoe features a traditional drop and is ideal for the runner who is used to running in a traditional drop shoe. The traditional drop helps to propel the runner forward and promotes the natural movement of the foot. - Built-in heel counter keeps the foot locked in place. This cross-training shoe is ideal for the novice runner who is just getting into the running game. It provides the right amount of cushioning, support and protection to keep runners safe and comfortable during their workouts. The upper is super lightweight and breathable and keeps runners from developing harmful blisters and hot spots. The CMEVA midsole foam unit and the Memory Tech Sock Liner adapt to the shape of the foot, providing arch support and comfort for a variety of foot shapes and sizes. This shoe is also offered in wide sizes for runners who need that accommodation. The outsole provides additional traction and protection against the elements. Since this shoe is an older model, runners can expect to save money, making it a great option for the runner on a tight budget. The style is sleek and slim and offers runners multiple different color options. This is a neutral running shoe that is also suggested for cross-training activities like group fitness classes, walking, hiking on groomed trails, and track workouts.